Lots Going on right across our Region! come along get involved! get active! In the three months since the Election of the Conservative Government we have seen an escalation of the attacks on worker’s rights and on the poor and vulnerable in our communities. As Unite Community Members many of you are at the forefront of resistance to this government and its attacks on our communities. As you know, Community branches across our region are working tirelessly to stand up for public services, fight welfare sanctions and support communities and workers who are under attack from the Tories. Listed below are just some of the campaigns and events which we are organising over the coming weeks and months. It is by no means exhaustive and new events are being organised every week. Our blogs and facebook pages are constantly updated and carry updates on all our events and campaigns. Many members have contacted us enquiring about travel provision for the demonstration outside the Conservative Party conference in Manchester on October 4th. Unite NEYH will be providing transportation to and from the demonstration for all our members and places will be available to book via the Unite website. 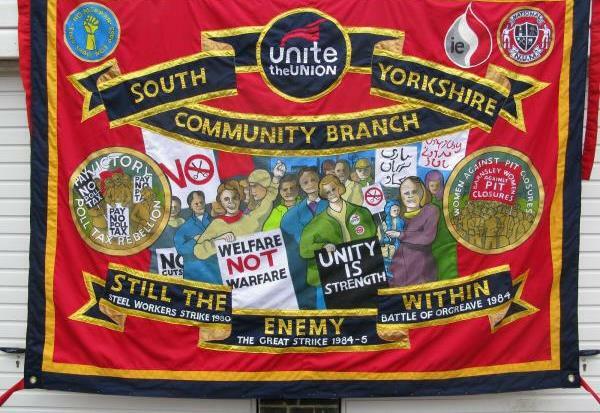 Unite Community are hoping to have a strong presence at the demonstration as we did at the People’s Assembly march in London and the Durham Miners Gala. More detailed information will follow as buses and schedules are confirmed. * PIZZA EXPRESS – Unite Community members across the UK have been supporting1 Unite members in the hospitality industry in their struggle for better terms and conditions. As you may have seen recently our campaign in support of Pizza Express workers was featured in the National media. Unite are running a campaign to stop Pizza Express stealing their workers tips. Workers in this sector have to survive on very low rates of pay and often rely on their tips to make ends meet. Community branches will be helping to recruit Pizza Express workers to the Union and supporting them through pickets and demonstrations outside restaurants. This is a well organised nationwide campaign and we would encourage as many Community members as possible to get involved. * SPORTS DIRECT – An article in today’s Guardian newspaper reports that 25% of job seekers are being pushed into Z hour contract positions. One of the worst offenders in the abuse of casualised workers is Sports Direct. Unite Community will be holding a nationwide Day of Action against billionaire Mike Ashley and his Victorian employment practices. This will be timed to coincide with the Sports Direct AGM on the 9th September. Unite Community NEYH are hoping to co-ordinate events in all the towns and cities in our region. * FRESHERS WEEKS – We have so far arranged a number of events for the upcoming Freshers Weeks. Events are confirmed for Sheffield University, Sunderland University, Leeds and Keighley Colleges amongst others. With the continuing attacks on student financial provision and on further education funding it is imperative that we recruit and organise amongst students in further and higher education. We are hoping that every branch can organise a Freshers recruitment event in the Universities and Colleges in their area. I have ordered a new gazebo for the North East of the region and am producing student specific leaflets for these events. 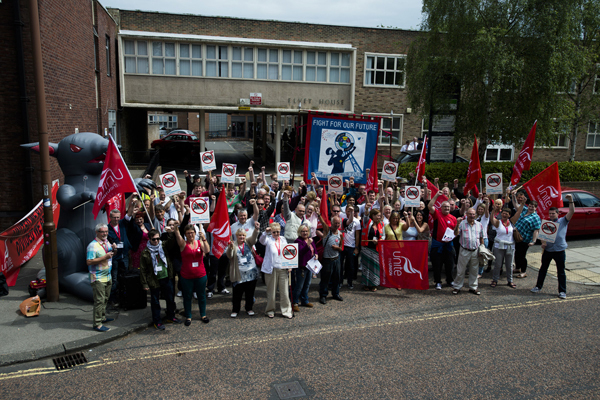 First of all I’d like to thank the Durham comrades for the fantastic welcome they gave members from across the region at this year’s Unite Political School and the Miner’s Gala. I know that our members from Yorkshire and the East Midlands who came to the Big Meeting this year enjoyed themselves immensely and that there will be even more of us making the journey up the A1 next year! Our members in Durham are cementing the great relationship we have with the Durham Miners Association and the local community by organising outreach work around social security rights and the fight back back against benefit sanctions in communities across Co Durham. The first training days in this programme take place on Wednesday 30th September and Thursday 1st October at Redhills, Durham. The second part of the course takes place across two days on the 7th & 8th at the same venue. A half day course on Benefit Sanctions and how to combat them is in the process of being booked. All the training is being led by professional Benefits Rights advisers from Durham County Council. We urge all our members in the NE who are interested to join us over these two weeks. If you are interested, please contact me directly and I will pass on your details to the team at Durham. As well as the fantastic ongoing work taking pace at Durham, recent months have witnessed the emergence of the beginnings of a new branch in Sunderland. Our Dynamic Duo of Kathrine and Dave have been joining scores of new members, been running street stalls and have even found time to set up a clothes bank in Penshaw! We will be leafleting across Sunderland and running street stalls in the run up to a public meeting in the city, after which we will constitute an official Unite Community branch there. Unite Community will also be in attendance at the Easington Heritage Day on the 12th September in the Welfare Park, Easington, Co Durham. The event is a celebration of the town’s industrial and political heritage and will feature a mix of music, arts and politics. Unite Community will be marching with our various banners and running a stall, transport ds being organised from across the region so get in touch if you’d like to join us for what looks being an excellent day out. In other good news from the North East, we note that far right extremists from the EDL have cancelled a planned march through Shotton Colliery on 5TH September. Nice to see the far right being pushed back in our region, let’s hope it continues. A nicer event altogether is taking place in Easington, Co Durham on Saturday, 12th September. As part of the National Heritage Open Day programme, Easington Colliery Heritage Group would like you to enjoy a day of celebration, reflecting on our past and highlighting our future. 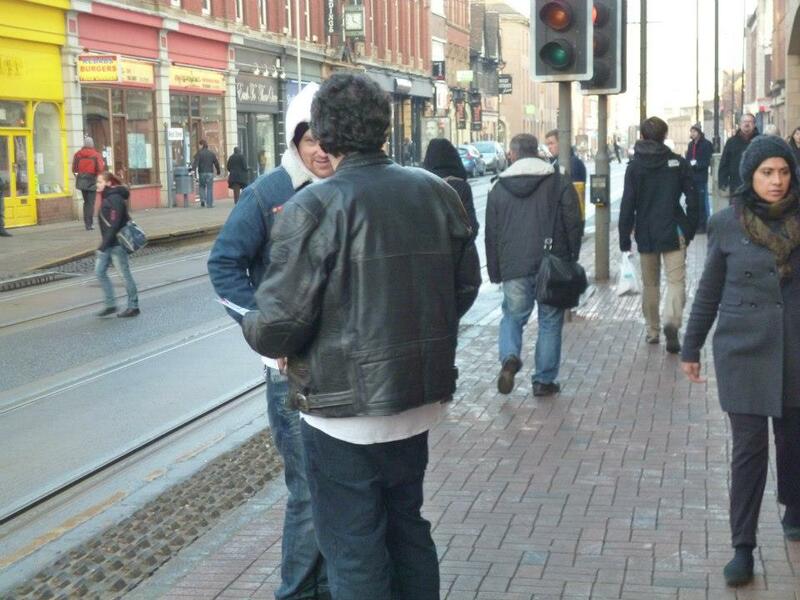 Over recent months the number of members living in and around York has seen steady growth. This is mainly due to the hard work put in by various members of the Leeds branch who have recruited scores of new members in and around the city at a variety of events. Until now members in York and much of North Yorkshire have been included in the Leeds City Branch but as their numbers have grown it has become apparent that we need to constitute York as its own branch. We will be contacting all members in the York area this week to ask for volunteers to sit on the branch committee. Full training is given to all branch officials and the Leeds branch committee will be on hand to assist with the setting up of the new branch. Again, please contact me via e-mail if you would be interested in taking up one of the positions. LEEDS CITY COLLEGE: Leeds members will be running a stall this Thursday, 27th August, at the Leeds City College Fresher’s` event. This event is being organised in conjunction with the Students Union there. We expect the event to be packed out and it should be a good opportunity to recruit members and engage with the students about the great work Unite Community is engaged in. Again, please get in touch if you would like to help out. Unite Community are planning to hold a recruitment stall at the Jeremy Corbyn event on Saturday 29th at the Crucible Theatre in Sheffield. We had stalls at the hugely successful events in Middlesbrough and Newcastle last week and signed up several new members. If anyone is available to help out in Sheffield please get in touch. Unite Community members have been helping out with industrial recruitment in recent months and we are hoping to continue this at a range of sites across South Yorkshire. Officers are currently running recruitment drives at ASOS in Grimethorpe and IPL in Normanton. If any members have an hour or two to help out with this it would be very useful indeed. 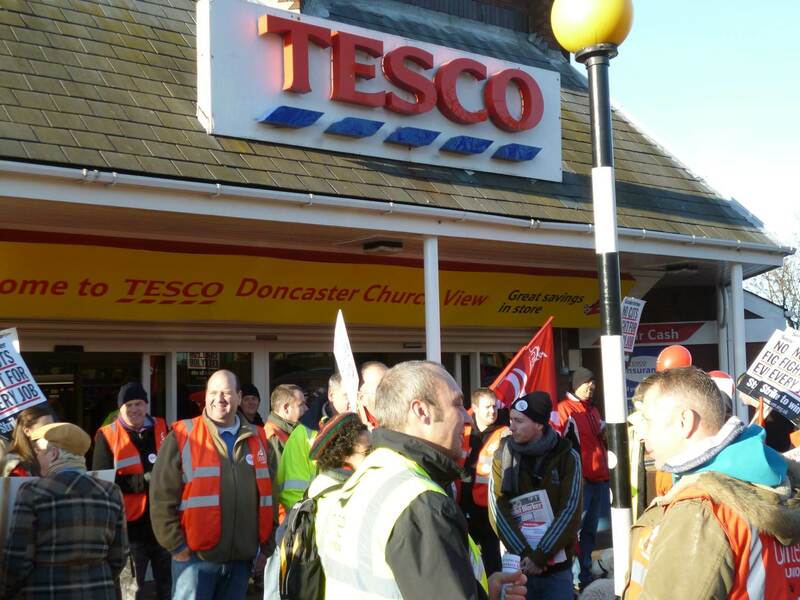 Please contact Richard.Bedford@unitetheunion.org if you can assist at ASOS, Grimethorpe or speak to Sarah.Mitchell@unitetheunion.org if you can help out at IPL, Normanton. Travel from Leeds, Barnsley or Sheffield will be arranged for any members living there. As well as running the hugely successful Community Support Centre in Barnsley, a number of our comrades there also find time to help out at the local Drop In club which feeds Barnsley’s homeless three times a week. The work the people do there is a lifeline to some of the area’s most vulnerable people. Unfortunately, as with many other projects, they really need more people to assist them. Anyone in the area interested in helping out should contact Peter, the project organiser on 01226 247652 or 0752 846 8327. As we prepare to start a new academic year I am beginning the task of contacting FE Colleges and schools across our region as part of Unite’s “Unite in Schools” project. This project aims to take educate the next generation of workers about the benefits of Trade Union membership and explain the positive role unions play in civil society. We are currently organising training for members to deliver the Unite in Schools programme and would encourage any members who are interested in taking part to get in touch. In addition to our Schools project we are also providing a wide range of training to our members. A full list of the courses available is detailed in the attached document. So, it looks like being a busy couple of months coming up for all our Community branches. I look forward to working with you all in the coming weeks and months and to forging ever more successful campaigns across our region. John Coan – Unite Community Coordinator NE,Y&H region. 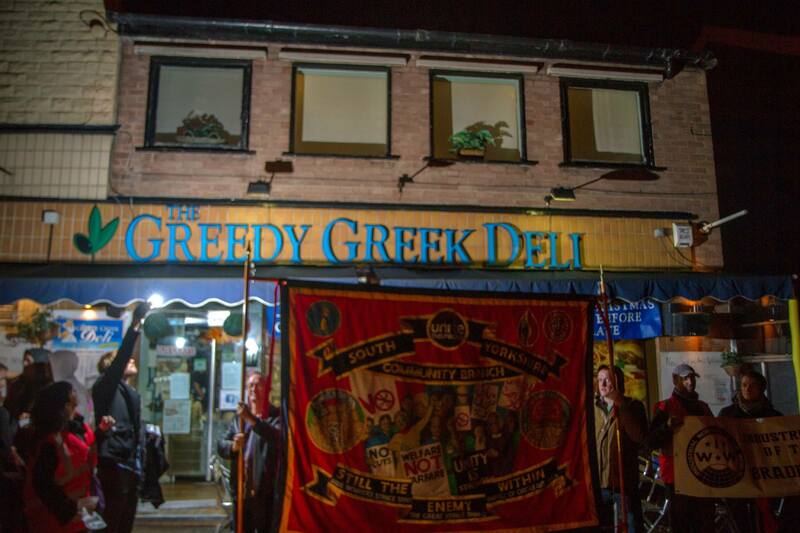 This report originally appeared on the Leeds Unite Community Blog. The conference was attended by about 100 people, including Unite Community delegates from various regions across the country, with 8 representatives in attendance from our own region of the North East, Yorkshire & Humberside. The background to the day was a recognition that unemployed and disabled people have suffered particularly from the government’s austerity measures and social security reforms. The reforms have brought increased poverty, depression, and even suicide for some, while there is also evidence of an increase in disability hate crime. Claimants are forced into low paid, insecure and exploitative work, and state payments are used to subsidise low pay. Through formal presentations and workshops, the conference aimed to produce a charter for welfare and explore ways in which collective action could be mobilised in communities and workplaces. The day was chaired by Kevin Flynn whose skill and good humour ensured the event went off smoothly. The day started with two presentations, the first by Helen Flanagan from the Public and Commercial Services Union (PCS) and the second by Eleanor Firman from Disabled People Against Cuts (DPAC). Helen Flanagan acknowledged the cuts in social security and the way claimants have been demonised. She also noted how sanctions have increased and that sanctions penalties are, proportionately, more severe than those applied to law breakers who appear in court. The relationship between claimants and Department of Work and pensions (DWP) staff has been poisoned, she said, and violent attacks on staff have increased. The PCS are against sanctions and have done considerable work to resist them, although the PCS is also under attack by the DWP as evidenced by the recent decision not to deduct members’ union dues at source. Eleanor Firman from DPAC told the conference about the work that had been going on in Waltham Forest where people are having to be defended against evictions as a result of the cuts in housing benefit and the bedroom tax. Impressive action has been focused on local housing offices and we were shown a short film which reflected this. A number of workshops took place before lunch. There was a session on sanctions, conditionality and the Work Capability Assessment and another on whether social security should be contributory or given as of right. The two remaining sessions focused on unpaid work, including workfare, internships, apprenticeships and traineeships, and equality within the welfare state. Each workshop reported back its findings to the whole conference. Common themes across the workshops included the need to stop exploitation and punitive social security policy and practice, recognising differences and the need for equality in experience of the welfare state and widening the idea of what we mean by contributory welfare. The need for a living wage also cropped up in many of the workshops. Some serious work had gone on within a short space of time. The afternoon kicked off with two presentations, one on the history of the Unemployed Workers’ Movement by Alec McFadden, who is President of Merseyside TUC and manager of the Salford Unemployed TUC Centre. Alec’s presentation was really interesting, however, sadly, the number of centres has now declined dramatically. It was acknowledged that Unite Community is beginning to respond to the needs the centres once fulfilled across more parts of the country. Alec suggested that there might be more collaboration between Unite Community and the TUC in this area. Richard Excell, the TUC’s Senior Policy Officer, reflected on the common interests between employed and how unemployed workers and Unemployed Workers’ Centres can break down the division between the two. He noted the low level of unemployment benefit and the cruelty of sanctions, which are now affecting large numbers of children. He suggested that middle, mainstream opinion is probably against such treatment and can be mobilised. The fight on sanctions, he suggested, should also be linked to the question of low pay. There were further workshops after Richard’s talk. Workshops included a look at the idea of a welfare charter and how unemployed workers might be better organised within the trade union movement. There were also sessions on benefits in kind such as energy allowances and one on blogging and how bloggers writing on similar themes could come together. As the chair suggested, perhaps the conference had witnessed the inaugural meeting of the National Union of Bloggers (NUB)! The themes from the workshops directly informed the conclusions of the conference. There was then an impressive attempt to draw the proposals of the conference together more. The idea of a charter, for example, could include higher levels of benefit and the living wage, rent controls, ending sanctions and workfare and looking at what is meant by contributory welfare, which could include the contribution someone makes to society through volunteering. A role was envisaged for the model that Unite Community has developed as a way of organising unemployed people. More formal negotiation over this was endorsed by the conference. Trades Councils are to be encouraged to adopt the charter once it has been developed. There will be a meeting on 25th March to take the proposals forward via a coordinating committee. Liane Groves, head of Unite Community, made the final address and gave a good overview of the union’s achievements to date. She emphasised the growth of Unite Community, which now has 8,000 members and 80 groups nationally. She particularly noted the success of the campaign on the bedroom tax and how some of its worse effects have been mitigated. She also gave examples of various local actions which have involved Unite Community, such as Durham’s Socialist Clothing Bank, pressure on councils to seek compliance from firms who provide goods and services to adopt the living wage, the refusal in Southampton to allow a populist TV programme on immigration to go ahead and the links with industrial members. Finally, Liane emphasised the importance of the campaign against sanctions and how success can be achieved in this area. It was an interesting if exhausting day and new contacts were made and ideas absorbed. The work of our local branch can only be enriched and improved by the exchanges we had. The charter, good collective organisation and the battle against punitive welfare measures, particularly sanctions, seemed to be the important themes of the day. Unite Community, North East, Yorkshire & Humberside Region. Under 27 and sick of minimum wage work? As part of TUC Young Workers’ Month we have organised a free event for workers to discuss issues around pay, politics and pressure. 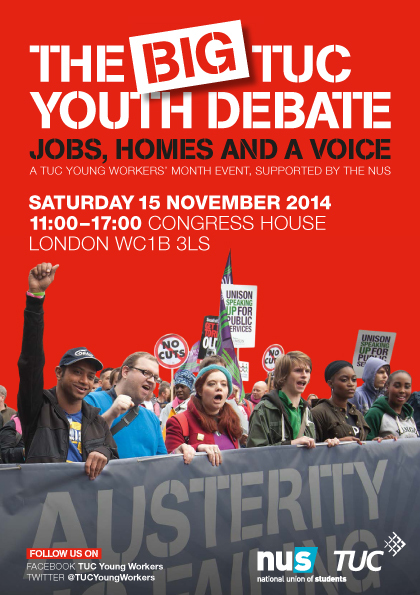 This event will explain the attacks on people’s wages and show how trade unions & campaigning can change it. This is the TUC’s main event for Youth Workers’ Month and we would like to encourage as many people as possible to attend, so please distribute across your networks. Registration can be found here.